Went to a gallery this other day and was able to gain exposure to, among others, Kwang-Young Chun’s installations. Mr Chun’s art (the ones I saw) consisted primarily of triangular plastic-foams wrapped in mulberry paper, tied with threads, and then glued onto panels. And there’s probably about thousands of these small items, intricately arranged in a way that they form a blanket of uniquely textured surface. Each of these triangles also bore Chinese characters, so that on the whole, the installations gave a sense of mystical character. 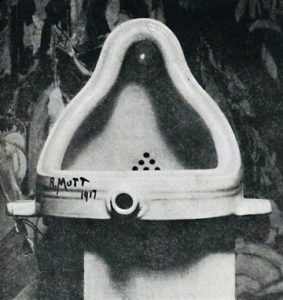 How do you not mention Duchamp’s ‘readymade’ when it comes to installation art? While the pieces were certainly intriguing, I was most struck by this sense of envy for installation artists. While writers (especially of the digital era), web designers, and digital artists are blessed with the ability to make changes to our works relatively easily without major reworking of our pieces (I hesitate to use this word), we tend to miss out on the chance to touch, to feel, even smell the physical materials installation artists work with. This direct interaction with the medium, the hunt for the right piece of material that the artist has in mind, the exhilaration from successfully (or, even failing to) assembling and piecing them together so that they finally form a coherent piece of art, it’s the kind of experience we are deprived of in our own creative process. How satisfying it must be to—say, for example—work directly on different materials that each portray a different facet of our works! Of course, I know it’s a naive thought. Each of us are subjected to the limitations of our craft, yet at the same time blessed with the magic unique to it. It did, however, remind me of just how much our lives have turned digital, and how much more will—in fact, I can imagine a near future whereby concrete jungles topped with digital representation of everything deprives our future generation of even knowing what it’s like to touch and feel grass. And you probably have to agree, that sounds like a terribly grim future.